I thought my penchant for my teddy bear was a sign I was going a tad doolally tap. I feel strangely reassured by your post, can’t for the life of me think why? Welcome to the Club Lettice ! I thought it better to showcase this little person than write about the current insanity of the UK. Haven't spotted anything or anyone in my garden yet but foot prints in the snow, friend H … Greetings from deep Winter Alberta, Canada … Much love, cat. Hello Cat not surprised about the footprints in your garden, there are a lot of them around and am not suggesting that you should track them to to their lair for it is better to be safe than sorry. I could do with his help around the garden. Does he like weeding? Oh yes he is very active in gardens. Well he would be would't he after all he lodges in mine. Tell you what send me his train fare and make solemn promise to provide him plenty of whiskey each day and he'll be with you in no time flat. No tree elves in my garden I'm afraid. Pip the Pixie spends plenty of time here though. Hello Graham, am very glad to read that at least one member of the family works in your garden or is Pip a house carer ? Pip the Pixie is a Very Special Person, Heron. I will blog about him. I am looking forward in seeing and reading about him Graham ! I rather like your little person but I have so many steps in my steep garden I doubt he could manouvre around here. I could do with his chirpy presence though. Weaver your steps would not prove to be a problem, for he is very light, nimble and well able to jump great heights! Well Simon, I am certain that they are quite near to you. It is just that being quite shy they do not always allow people to see them. Mrs May only dishes out those grants in May which may have been named after her...but then again there's Mother Theresa. Are they one and the same? 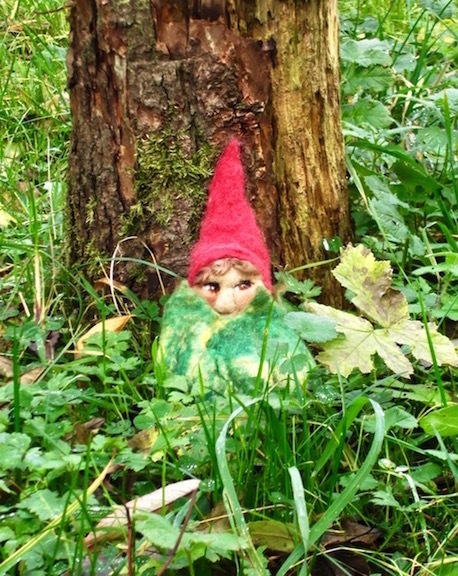 By the way I have three garden gnomes in my garden and one of them is the spitting image of your good self. Maybe I will apply for a beard shaving grant. O horror of horrors YP ! It seems that you are blaspheming both the Month and the PM in one go. You will end up in the Tower if you are not careful. Three gnomes in your garden ? Gosh I hope that it is a large one so that they are kept active for gnomes with little to do can cause trouble. I really cannot believe that you would have the audacity to shave off a gnomes beard - that is very ignoble of you to even think of doing so, I am quite dismayed. Philip May is also often dismayed except on his birthday when Mother Theresa opens her red box and relents for five minutes. This is the most rational bit of reporting of seen in days! Many thanks for your wisdom and utter honesty Mitchell, I am very grateful to you dear man. Jack L said : The idea of green foliage, flowers and fairies emerging in nature...... sounds wonderful from where I 'm sitting in frozen, snowy windswept Manitoba !! Thanks Jack. I can only imagine how chilly it must be for you and am glad to be here in Ireland. Wise observations, Mel. Happy frolics are so much more encouraging than the current political scenario. Many thanks Val. I think that we ought to review the current method of government as it is not working satisfactorily, suggest politicians are put out to grass and we let professional civil servants do the work whilst we the people vote on policy. I think your garden gnome is waking up; he's got too much hair to be a newborn. Or is it a she? LOL. I must chime in with your followers across Canada. Still frozen and snowy here in Quebec as well. Not even footprints, unless you count squirrels. It will be quite a while before the gnomes and faeries wake up in my yard. Well, actually they all hid in the garden shed at the first hint of snow back in November. For you know what happens to lazy gnomes caught napping under the snow! They turn into popsicles! Wendy, firstly wishing you a Fun filled Valentine's Day ! and secondly: I think you look at the fae folk as being like humans, they may appear to be so however, they are nature creatures that never age or die, they continue in their chosen form and never change or age. Ah, you are quite right. I sometimes get swept away by imagination. Happy late Valentine's to you!